The card game Hasenpfeffer is a very close relative of Euchre but adds a 25th card to play -- the Joker, which is always the highest trump card. Otherwise, gameplay is very similar to standard Euchre. The name hasenpfeffer comes from the traditional German stew made from marinated rabbit or hare. The rules of Euchre, Three-Handed Euchre, and Railroad Euchre are also available. Players: Hasenpfeffer is played by four players (in two partnerships). Deck: Hasenpfeffer uses a 25-card deck (with the 9, 10, J, Q, K and A in all four suits, plus the Joker). Goal: To be the first partnership to score at least 10 points. The general rule is that aces are the most valuable cards, and 9s are the least valuable. However, there are three exceptions to that rule. The first exception is the Joker, which is always the highest trump card. It ranks higher than even the right bower. The Jack of the trump suit is the "right bower," and it's the second most valuable card. The other Jack of the same color is the "left bower," and it's the third most valuable card. Both bowers are part of the trump suit. For example, if hearts is the trump suit: the Jack of hearts is the right bower (second most powerful), and the Jack of diamonds is the left bower (third most powerful). In this example, the fourth most powerful card would be the Ace of hearts. Partners should sit across from each other. The first dealer is chosen randomly. Six cards are dealt to each player. The one remaining card is placed face down in the middle of the table. This card is known as the widow. Note: Most players deal the cards three at a time. 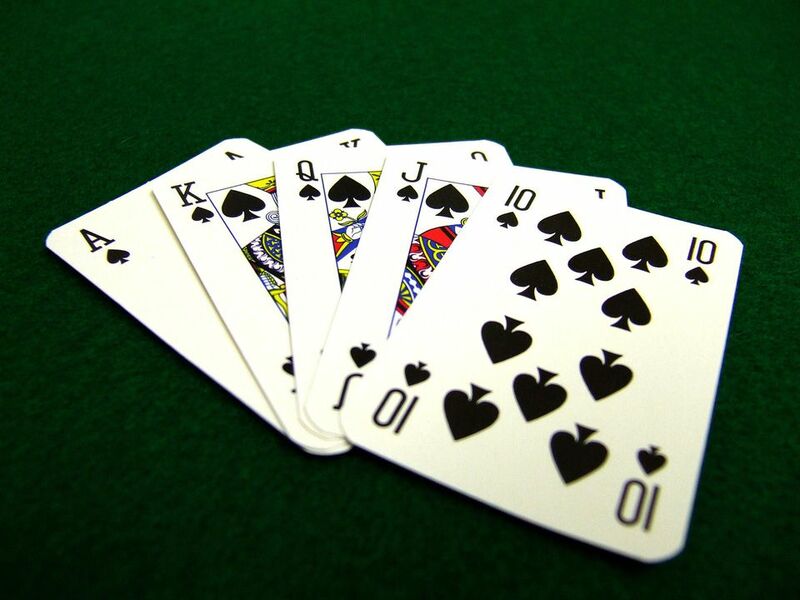 Players bid, starting with the player to the left of the dealer and continuing clockwise. Players may pass or bid a number from one to six. Bidding continues for as many rounds as necessary until three players have passed. The high bidder picks up the widow, names the trump suit, and discards one card from his hand face down. The highest card played in the lead suit wins the trick, unless one or more trumps were played, in which case the highest trump card wins the trick. The player who wins the trick leads in the next trick. If the partnership that made the highest bid meets its bid, it scores one point per trick won. If the partnership that made the highest bid fails to meet its bid, it loses one point per trick won. (Negative scores are possible.) The first partnership to score 10 points wins. Players bid, starting with the player to the left of the dealer and continuing clockwise. Players may pass or bid a number from one to five, "little pepper" or "big pepper." Bidding continues for as many rounds as necessary until three players have passed. "Little pepper" is a bid of six, with normal stakes. "Big pepper" is a bid of six, with the stakes doubled. Note that anyone can bid "big pepper" at any time -- it is not necessary for a bid of "little pepper" to take place first.